The Organic Gardens of Learning are the true and inspiring story about making a dream come true - to change the environment we live in - and about creating green oases of fertility in the heart of the large city. We created a real and accessible opportunity for our children to have daily, fulfilling and educational contact with live nature. The idea for the Organic Gardens was born in 2010 after a peculiar question: “Mom, what tree do tomatoes grow on?” But the reasoning behind the project goes much deeper. It is the concern that our children are born and live in a world made of concrete and asphalt. How would they learn to live a healthy life and love nature, when they do not know and understand nature? How would they gain awareness on environmental issues and grow to be responsible individuals, when they do not have the chance to build a positive personal relationship with nature? As parents, we fully understand that true knowledge comes from first-hand experience. We understand that making the best decisions is in our power and are at our fingertips. This is why we decided to dedicate our time and energy to creating something worthwhile that is interesting to both our children and ourselves. In 2012 parents and teachers from ten state kindergartens in Sofia took the challenge to create the first Organic Gardens of Learning - natural and green classrooms in the kindergarten yard. There, children can learn, work, observe, create and study the principles and mysteries of living nature. A journey of a thousand miles begins with a single step. A beautiful garden begins with a dream and a single seed. But if we want to get far, we need to make the journey together. This is why we decided to learn how to create a garden, to study, work and live having a positive dialogue with children, together with teachers, parents and the local community. Everybody was involved in the process - both young and adult residents of our city. We took all decisions together: where to create the gardens, what they should look like, what plants to choose, how to take care of them, what lessons we should learn. More than 3000 children, parents and teachers took part in creating the Organic Gardens of Learning. Together, we made the soil, seedbeds and pathways ready, we drew signs, we assembled composters. Every day devoted to creating an Organic Garden of Learning turned into a cheerful and unforgettable celebration for the entire community. Each of us learned a lot about the garden, about where food comes from, about organic farming, and about permaculture. We learned that indeed there is no need to use toxic chemicals in farming. We learned how to take care of the soil and make it fertile, how to value and respect natural resources. We learned a lot about the hidden talents and positive qualities that each child and adult carries within. Together, we cherished the beautiful moments of play, collaboration and positive communication. Personal experience is the best way to learn. Every child participated in the care for the garden: they planted seeds at home with their parents, waited to see how the plant sprouts and gets stronger, planted them in the garden’s seedbeds, and took care of the growing plant. Children watered, mulched and observed the growing plants with a lot of love, awaiting the harvest. They celebrated every new leaf, every new blossom and every new fruit as a common success. The lessons we learned go beyond straightforward gardening. The scientific approach, conscious care, persistence, patience and the satisfaction of seeing the end results are priceless skills for life. Healthy eating became a favourite game, which formed tastes and perceptions for life. Indeed, the most delicious cherry tomato is the one that you have grown yourself. We celebrated the first rich, delicious and healthy harvest together in the Organic Gardens of Learning. In the beginning of autumn, the children invited us to the Harvest Celebrations. They sung and danced, and thanked everybody involved in creating the gardens. Some of the most favourite moments in this project were those of children proudly sharing their harvest. The greatest success is that the Organic Gardens of Learning brought living nature to the big city. Before winter fell, the young gardeners made sure that the Organic Gardens would be ready for the next season. Together, they mulched the seedbeds with a warn cover of autumn leaves. The children and their parents await the next season of nature lessons in the Organic Gardens of Learning. While creating the Organic Gardens, we gave our children memorable lessons in gardening and a creative approach to life. But we also gave them the chance to develop their senses and intelligence through the wealth of personal experience with nature. The Organic Gardens of Learning are a good exercise in organic farming. But they are much more: a step towards a positive change in our outdated educational system; a tool for integral education, which opens a new horizon for harmonious development; evidence the only source of true positive change in our life is within us - a group of ordinary people, who learned how to bring our dreams together. We learned how to do little things, while investing a lot of love in them, in order to give our children a better chance to develop in a greener present - here and now. We wholeheartedly thank America for Bulgaria Foundation, who supported our efforts to make this wonderful idea a part of the lives of thousands of children in Sofia. We know that once this adventure has begun, it will continue. We know that every new season will see more groups of teachers, parents and friends coming together and happily devoting more time to be with their children, to learn and communicate with them. We know that they will create new and delicious Organic Gardens of Learning in all corners of beautiful Bulgaria. If you are among them - we will be very pleased to meet you. FORMING OF LASTING SKILLS AND ATTITUDES OF HEALTHY WAY OF LIVING in harmony with ourselves, people around us and nature as a whole. The lack of integral educational practices emphasizing the practical life experience or so called “experiential learning”, “learning by doing and by playing” giving each child the possibility to develop in-depth and integral knowledge on a certain topic and a wide range of lifelong personal and social skills and competences. The lack of good practices for creative dialogue among the teachers, parents and the local community aiming at developing the education and the children as complete individuals of our society as well as the lack of creative time for the children and their parents to spend together doing something positive, favourite and useful for all. The lack of the so irreplaceable daily meeting of the children of Sofia with the Nature as a source of knowledge and inspiration to love, respect and live in harmony with the Nature. The creative SOLUTION we propose with this project is to initiate and support the creation of a network ot ten Edible Organic Gardens of Learning in ten state kindergartens in Sofia adapting and using the positive experience and good know-how of the United States of America, so called Gardens of Learning in Kindergarten (for example www.csgn.org). Planning and construction of the organic gardens of learning – design and building the plants beds, paths, watering system, composters and more. Development of organic gardens through volunteering actions - a joint effort of the integrated community of children, parents, seniors, students and community members. Planting and care for the tasty gardens of learning – preparation and delivery of interactive educational modules and events for the children and the local community. Celebrations & open days in the organic gardens – at least two public events in each garden to promote the gardens. Development of a Handbook on organizing basic training sessions in learning by caring for the organic garden in the kindergartens. 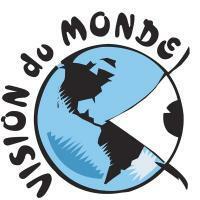 Planning for sustainable development – a workshop to present and analyse results. Initiating a public debate on the integration of the organic gardens of learning into the formal educational program of public kindergartens. 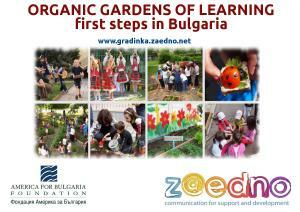 In 2011 ZAEDNO implemented successfully a project for creating the first in Sofia Organic Garden of Learning in the Kindergarten - www.gradinka.zaedno.net. There was a huge interest declared by many parents and teachers and we received a lot of requests for realization of similar Organic Gardens of Learning in other kindergartens in Sofia. Installing the composting system and producing humus soil. Planning the long-term and sustainable development of the garden.